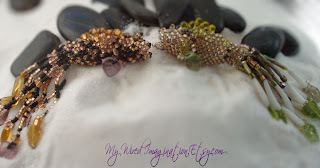 I don’t get near enough time to ‘just bead’ as I would like. 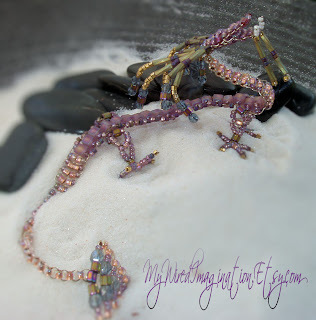 I love making these 3-dimensional Beaded Dragons, but since I reduced the size of the beads from 6’s and 8’s to size 15 Delicas, and Japanese seed beads, they take up to 7 hours to complete one. 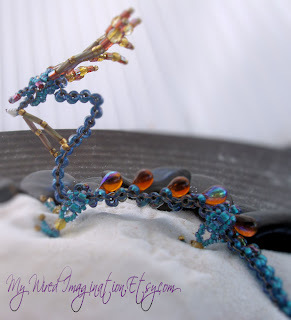 Not to mention, I deviated from the original pattern, which used only one shape of bead – I incorporated 11 different shapes and sizes. 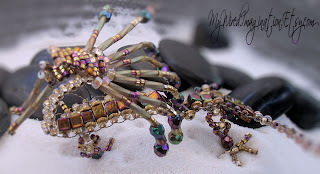 And if that was not enough self-torture, I modified the pattern on these beaded fish too, and incorporated a total of 17 different sizes and shapes of beads – These babies take upwards of 7 hours each to complete. Talk about a glutton for punishment… :)) The one on the left is modeled after my favorite pet Koi…. Bobbi these are wonderful! Scrolling down with each picture I kept oooing and awwing…then I saw the koi! Absolutely beautiful work! Definitely think about selling them, they're gorgeous!